It's things like this invention that make you think, it's so simple, yet so brilliant, why hasn't it been done yet? 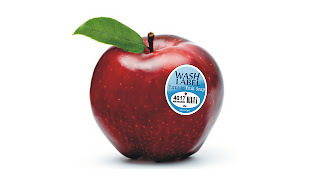 Scott Amron has created a label for apples and other fruit that turns into soap when wet. Ridding your fruit of all the bad stuff on there. And you don't have to scrape off the sticky residue of other labels. Talk about an ingenious product innovation. Dole or other fruit companies better already be banging on this Amron's door.